We are a customer-focused flooring company and very proud of the quality of our services – not only do we supply laminate, vinyl and real wood flooring and carpets of the very best quality from leading manufacturers; we also offer expert advice, free design, fast delivery and professional floor fitting too. Our floor fitters serve both the domestic and commercial sectors, including all insurance work, across the South East, Kent and London. The majority of our custom comes through word-of-mouth and we are delighted to be a company our customers trust enough to recommend to their friends. We also have an impressive portfolio of prior flooring installations, from new carpets to vinyl and laminate flooring, available for you to view on request. We strongly believe that when it comes to installing new flooring, only the best will do. In a thriving business or a lively family home, the floor needs to resist the effect of a lot of wear and tear, and a poor quality floor will show its age faster than you may realise. The carpets and flooring we supply at Lifestyle Designer aren’t budget range – they start at good value and progress in quality to the very best you can buy. Lifestyle Designer Floor Covering's ranges are designed to accommodate almost all budgets. We make high quality new carpets, safety flooring, oak flooring, laminate flooring, real wood and vinyl flooring available to everyone so we buy direct from the manufacturers to keep our overheads and prices low. 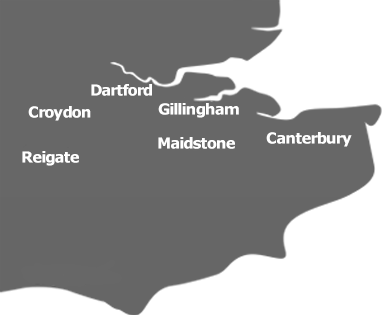 Based in Rochester, Kent, we provide homeowners and commercial businesses from across the South East with the finest mobile flooring service. We have delivered and fitted carpets, laminate flooring and vinyl flooring to customers in Rainham, Chatham, Gillingham, Rochester, Maidstone, Herne Bay, Canterbury, Ashford, Whitstable, Faversham, Sheerness, Ramsgate, Aylesford, Gravesend, Dartford, Sevenoaks, Sittingbourne, Crawley, Caterham, Tonbridge, Medway, Swale, Tunbridge Wells, Bexley and Bromley. To discuss your individual flooring requirements with experienced and friendly fitters, please contact us today. One of our new carpet and designer flooring experts will be more than happy to supply you with a free property survey and no obligation flooring quotation at your convenience.